Now the campaign for the upper house election in Japan has started, tough rules on how politicians can canvas for votes have come into force. Surprisingly, in a country with some of the fastest broadband speeds and a wide internet penetration, it is now illegal for candidates to create new websites or update existing web pages between now and election day, 29 July. So instead, the loudspeaker vans are out on the streets again. The candidates sit inside, waving regally wearing white gloves, smiling and politely asking for votes. Prof Phil Deans, who works at Temple University in Tokyo, describes it as "almost a throwback to the 1950s". "Cars with speakers on the roof, the use of posters, leafleting, and the almost complete absence of electronic media to communicate political messages, is one of the most startling things about the way elections are conducted here," he says. Kan Suzuki wants to change all that. He is a lawmaker who wants to modernise the way elections are fought here. 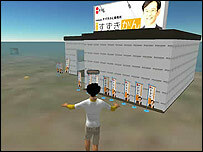 He has built an office in Second Life, the virtual world where you can work, play and interact with others. Here, he says, he can get his message out to people who do not normally listen to politicians. But now that the campaign has started, he has had to close the office temporarily. "Basically, the election law was drawn up in the 1950s," he says. He is also critical of another old-fashioned rule, limiting the number of posters and leaflets that a candidate can give out. "In my constituency, I can only distribute enough for 3% of voters to get a leaflet from my party. So 97% of voters can't. How can I reach them?" Usually Japan allows its politicians to use the internet to communicate with voters. But as soon as an election campaign starts - the time when you might well think you would really want to communicate with them - the use of electronic media for campaigning is banned. Instead it is on the traditional media where politicians hold court - for instance, on ponderous political TV discussion shows that sometimes look like they have not changed in 20 years. 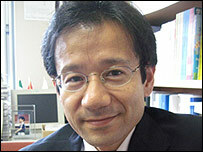 Prof Yasunori Sone, a political analyst from Keio University in Tokyo, says Japanese election law is very strict. "There are many rules and prohibitions. But many parties want a strict law to contain other parties' political activities," he says. "Some of us are trying to get the law changed. But the number of supporters for a change in the law is very small." One group you would think would be keen to see the internet used in campaigning is young voters. In Japan, 95% of people in their 20s surf the web, but only a third of them bother to vote. Some, though, do not seem keen on politicians using the web to try to win their support. "I believe that internet resources are not very official," says Kentaro Shimano, a student at Temple University in Tokyo. "YouTube is more casual; you watch music videos or funny videos on it, but if the government or any politicians are on the web it doesn't feel right." "Japanese politics is something really serious," she says. "Young people shouldn't be involved, I guess because they're not serious enough or they don't have the education." There cannot be many places in the world where students feel their views should not count. Perhaps it is really a reflection of the reality - that they do not. Here in Japan, it is seen as important to treat politicians with respect. But such is the deference paid to them, it is hard for anyone to challenge them to try new ways to make the political system better.